After a joyful visit to the Senior Dancers group in December 2017 I was excited to have another chance to dance, meet, and dream up future activities with this very active group from Moberly. Matthew and I arrived a few minutes after 10:30 and were greeted by instructors Anna and Olivia who apologized for the smaller than usual class size. The group, which often includes more than 30, was a modest 5, plus the instructors, Matthew and myself, and late in the game guest appearance from Oliver. Despite our small number, energy was high as we shared our names, moved through a seated warm-up, and then got moving on our feet with side stepping, reaching and clapping. It wasn’t long before I had shed my sweater and was pink cheeked from dancing and laughing. Together we mirrored, clapped, snaked, shook our bodies, made shapes, and tried our best to step left and right at the same time. 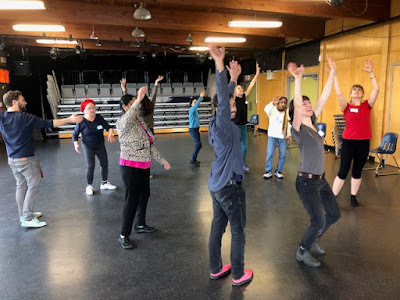 It seems clear that the dancers gather each week for the fun of moving AND the joy of the company (and perhaps the post-class tea and cookies…). Matt's pink shoes were just one highlight of the dancing. 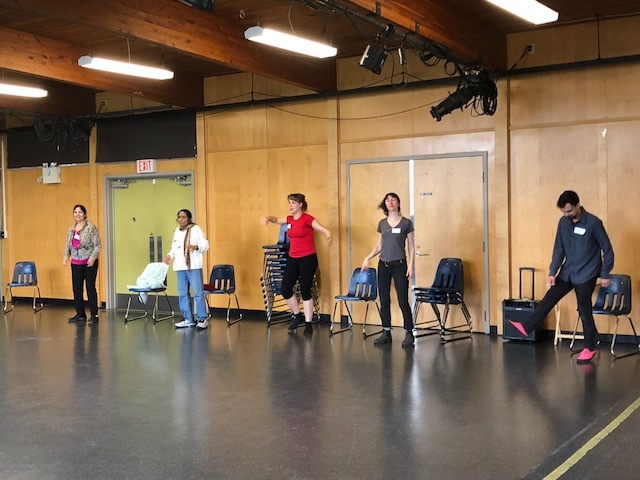 I can’t wait for my next Thursday morning dancing visit, and to work with some of these amazing dancers on upcoming projects.